Grace Mugabe was born in South Africa where she stays until the age of 5. Grace Mugabe got married while she was a teenager but the marriage didn't last. Grace Mugabe went on to do some secretarial courses and that's when her destiny changed during a recruitment drive. "We started working together and I worked in his (President Mugabe) office for a long time"
When Grace was asked if she knew that President was attracted to her, Grace said "At that time I looked at him as a father figure and I did not think at all he would look at me and say I like that girl." "He started talking to me and asking about my life, if I was I married before and things like that"
"At that time I thought he was just interested in knowing about my life since he was my boss but I didn't know that it was leading to somewhere". "I'm a very shy person and none of my colleagues knew that he was interested in me and he never showed it"
While love blossomed between President Robert Mugabe and Grace and children being born, he was still married to his late wife Sally Mugabe who was terminally ill at that time. When asked if she was okay with falling in love with a married man, Grace said "I felt a bit uncomfortable when he proposed to me since he was still married to Sally. I talked to my sister about it and he called his sister Tete Sabina because I was saying no because I didn't want to get in this kind of relationship. He called my sister and convinced me and things started." Asked about the affair Mugabe, suggested that it was part-inspired by “practical considerations”. Mugabe opened up more about how his relationship with Grace began, adding that in light of his mother wanting grandchildren he decided to “make love to Grace”. Ms Marufu as she was formerly known, happened to be the woman who was closest to him and Mugabe claims, at the time Marufu was herself going through a divorce at the time. 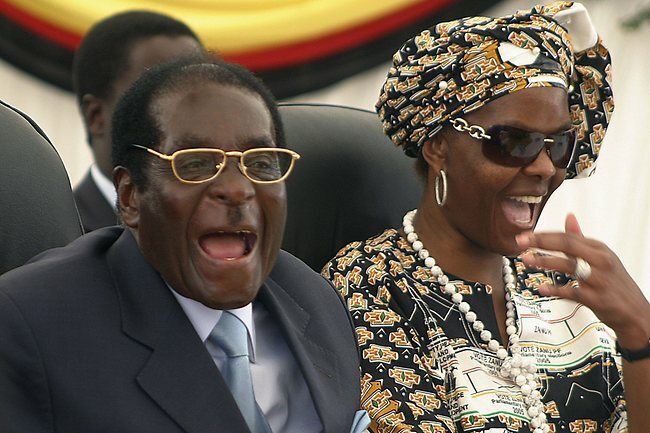 “She did ask me whether I still loved her, ” Mugabe said, to which he replied that he did. Talking about his flourishing relationship with Grace, Mr Mugabe said when he said he wanted to marry her (Grace), he meant it. “I said to her from that moment on if I had any girlfriends, I would leave them and that’s what I have done to recognise her and her alone as my partner. Whether she believed it or not, that’s what it has been.